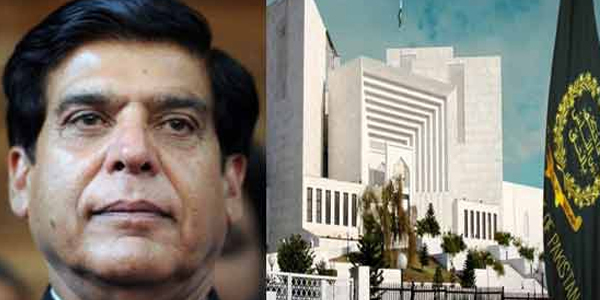 The leadership of the Pakistan People’s Party (PPP) and its allied parties on Sunday resolved to adopt a reconciliatory path with the superior judiciary and it was decided that Prime Minister Raja Pervez Ashraf, flanked by leaders of allied parties and his cabinet ministers, would appear before the apex court today (Monday) in the NRO implementation case. President’s spokesman Farhatullah Babar also confirmed that the PM would appear in court today. Elaborate security arrangements have been finalized on the eve of the court appearance of Pervez Ashraf and a provision for aerial surveillance of the Red Zone has also been made. On Sunday, the Presidency remained involved in consultations to decide whether or not Prime Minister Ashraf should appear before the court and whether the letter should be written to Swiss authorities in case the coalition partners agreed to the proposal. However, sources in the PPP said there was a difference of opinion within the ruling party and influential leaders like Yousaf Raza Gilani, Qamar Zaman Kaira, Nazar Gondal and even Prime Minister Ashraf opposed the proposal forwarded by Law Minister Farooq H Naik seeking a middle ground to resolve the matter with the judiciary. “Even President Zardari was in favor of a reconciliation with the court, but there is considerable resistance from within the PPP. Gilani and his close aides questioned the strategy, arguing why Gilani had been sacrificed if the letter had to be written to Swiss authorities,” the source added. The source said in a bid to convince Ashraf, Zardari held an exclusive meeting with the PM before the meeting of leaders of the allied parties. Earlier, Pakistan Muslim League-Nawaz leader Nawaz Sharif also proposed the government through backchannel to seek a resolution to the matter of Swiss letter. During the allied parties’ consultative meeting with President Zardari and Prime Minister Ashraf, the coalition leaders advised them to respect the court’s order to avoid any chaos in the country. The Muttahida Qaumi Movement (MQM) went a step ahead as its spokesman Wasay Jalil made a public comment over the rumors asking that the government should not to show disrespect to the apex court. “During Sunday’s allies meeting, PML-Q chief Chaudhry Shujaat Hussain also advised the president to show restraint and handle the matter wisely. Shujaat said the personal appearance by PM would yield a positive result and would send a goodwill message to the judiciary,” a source in the PML-Q told Pakistan Today. The Awami National Party, however, came in full support for Ashraf and its leaders called for an appropriate strategy to deal with the court order. President’s spokesman Farhatullah Babar said Law Minister Naik briefed the coalition partners on various legal issues pertaining to the NRO case. Naik also briefed the meeting on legal implications if the PM did not appear before the court. Yousaf Raza Gilani was also invited to attend the meeting, the spokesman said. The meeting presided over by President Zardari and Prime Minister Ashraf was attended by former PM Gilani, ANP President Asfandyar Wali Khan, Chaudhry Pervez Elahi, Raja Basharat Ahmad, Dr Farooq Sattar, Babar Ghauri, Makhdoom Amin Fahim, Afrasiab Khattak, Syed Khursheed Ahmad Shah, Rehman Malik, Farooq Naik, Munir Orakzai, Hameedullah Jan Afridi, Senator Rashid Ahmad, Senator Kulsoom Parveen of BNP-Awami, Khuda Bux Rajar of PML-F and Farhatullah Babar. Babar said the meeting discussed the current political situation in the country with particular reference to the court cases the government was facing. Naik gave a comprehensive briefing on the issues involved in court cases and the options available to tackle them. After an in depth discussion on the points raised by the law minister and weighing available options the meeting decided that in line with the coalition government policy of showing respect to the majesty of law, the prime minister would appear in the Supreme Court on Monday. It was further decided that as a demonstration of solidarity, the coalition partners would accompany the prime minister to the courtroom. The coalition partners also resolved to remain united in facing all challenges confronting the government and the prime minister. The president and the prime minister thanked the coalition partners for their continued support in the face of all challenges and said their support was most valuable for political stability in the country. The president also hosted a dinner in honor of the participants of the meeting. The discord and disagreement among the PPP ranks and coalition parties was so strong that former prime minister and senior vice president of the PPP Yousaf Raza Gilani had to issue a statement to clear the air as he claimed there was no difference of opinion within the ruling party about the strategy to deal with the court appearance of PM Ashraf. “There is no double mindedness or confusion in the ranks of the PPP leadership regarding the appearing of the prime minister in the Supreme Court on August 27 and the leadership in consultation with coalition partners will decide whatever is in the largest interest of constitution, democracy, independence of judiciary and the rule of law,” Gilani said. He said media reports of double mindedness and confusion in the party and allies on the subject were contrary to the facts. He said that separation of powers as defined in the constitution must be adhered to by all three arms of the government, executive, legislature and judiciary, which would ensure keeping the democratic process on track, but warned fiddling with it due to the self-righteous narrative of ‘activism’ will definitely push it over the cliff with consequences that the country and the people cannot afford. He said the PPP and the coalition government held judiciary in the highest esteem. it is a very good gesture of the government to appear before the court,even though the court is acting illegaly and un constitutionally. Like its founder`s policies,first NO NO NO then YES YES YES what a double and hypocratic dirty politics being played by ppp,In that way they are not serving the sipirit of Democracy .Be fair,Be honest to real cause and do better so that no need to see these days.Plz create realitic political and fair policies. Why criticize government, their track record is before the nation, they do not believe in the rule of law, how do u expect them to obey the court orders.This is the darker side of Pakistan's democracy. 1) Can a convicted and criminal become president and represent pakistan? 3) Were was the law in the last 04 years? 4) Same applies to all who are holding key governemnt positions. 5) what is the role of agencies in this regard? Swiss accounts were not known when he became president? O people just remember all these 5 years and do accountability on your own.you can all hold them accountable for their misdeeds together with allied parties.vote against them in coming election.